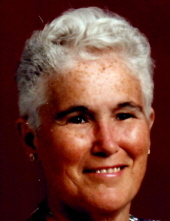 NEW BEDFORD-Brenda M. (Saunders) Moniz, 78 of New Bedford, died Monday, February 4, 2019 at home, surrounded by her family, following a long period of declining health. She was born in New Bedford, the daughter of the late Milton Saunders and Naomi (Jarvis). Brenda was a devoted homemaker. She was a communicant of Holy Name of the Sacred Heart of Jesus Church. She attended School for the Deaf in Randolph; she was a member of the Red Hat Society, loved sports especially Patriots and Red Sox but most of all enjoyed spending time with her family. Survivors include her son: Steven Moniz and his wife Debbie of Texas; 2 daughters: Kim Moniz and her companion Luis Ortiz of New Bedford and Jody Grundy and her husband Brian of Berkley; brothers: Wayne Correia, Daniel; Correia and Michael Saunders; sisters: Elaine Pacheco, Kathy Notarangelo, Debbie Baldwin and Donna Peters; 5 grandchildren: Randy Souza, Krystal Souza, Ryan Souza, Abigail Grundy and Amber Ortiz, 5 great grandchildren, several nieces and nephews. She was the sister of the late James Correia. Her funeral service will be announced in the future. Funeral arrangements entrusted to AUBERTINE-LOPES FUNERAL HOME, 129 Allen Street. For online guestbook, directions and additional information, please visit www.aubertine-lopes.com. To send flowers or a remembrance gift to the family of Brenda M. Moniz, please visit our Tribute Store. "Email Address" would like to share the life celebration of Brenda M. Moniz. Click on the "link" to go to share a favorite memory or leave a condolence message for the family.